Balthazar is a french bistro located in Soho, New York City, right in the middle of all the best shopping. It is loud and always buzzing with people. It has a charming feel to it, and eating there definitely makes you feel like you are in Europe. 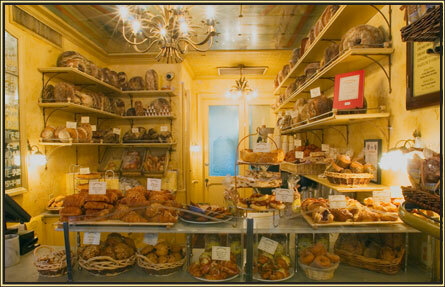 They have assortments of baskets of freshly baked bagettes all over the restaurant, and they also have a Balthazar bakery as well that is attached to the resturant with a wide variety of fresh bread, sandwiches, salads, soups, and desserts to choose from. I went with a group of friends, and there was an hour wait, so we went shopping and came back just in time to find our table being set. It was so crowded and there also was a long wait behind us. The ONLY reason I chose to eat at Balthazar was because Bobby Flay, (those of you who are familiar with food and cooking should know this famous chef), said that Balthazar had the BEST french fries he ever ate. Now, being that french fries are one of my top favorite indulgences, I had to see what made this famous cook say these fries were the best. We went for lunchtime so we all ordered small portions, whether it was soup and a side of fries, mac n’cheese or a sandwich, but the best thing that was ordered, (which was what I ordered), was the FRENCH ONION SOUP. It was amazing and perfect in every way. Just the right amount of cheese, and great flavor. It was if not one of the best, the best french onion soups I’ve ever had. Balthazar’s french onion soup. Amazing! Now, the french fries. They were just the way I like my fries. Very good, no complaints, but the best fries I ever ate? No. Not quite sure why Bobby Flay thinks the french fries at Balthazar were the best he ever had, considering the fact that he has eaten the best food in the world. They were just normal, good fries. They weren’t unique or anything special. We also ordered mac n’cheese with bacon (pictured below). It was good, but I would have liked it better without bacon- and I love bacon. One of the other people I was with ordered the lamb sandwich, (pictured below) which also was good/okay, but not anything to order again. We didn’t order anything bad by any means, but we also didn’t walk out of their too impressed either. Me and everyone else LOVED the french onion soup which is a must have if you go, and the fries were really good too, but again, not sure what made Bobby Flay say it was the best fries he ever ate. 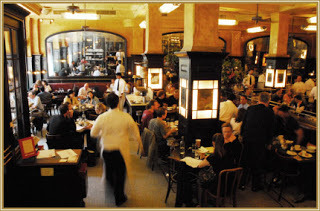 Balthazar is definitely a scene- a NYC hotspot that is always buzzing and a cute place to have lunch with friends. I would recommend this place just because it has a great vibe, and is very much alive and happenin’. I would definitely go back again and try some different things on the menu and give it another try because of the atmosphere.